Now has a small smoking area to the rear of building; on our recent visits I had pints of Ringwood Forty-niner [acceptable] & Titanic Iceberg [refreshing pint]. 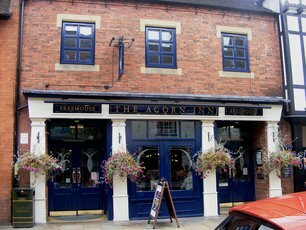 Nice enough 'Spoons to pop in to for a breakfast before heading off to a music festival at Catton Hall up the road. Looked like they had quite a few good beers on. As it was 8am I decided against them and contented myself with a cuppa and a fry-up instead. Maybe next time though as Lichfield looks like a place I might return to. Have been to this Wetherspoons a few times now, and it is my favourite of the two in town. The interior has been done up plushly, with the main drawback being a huge empty area around the bar, meaning less tables than expected – so it can be hard to find an empty one. There are 10 handpumps on the bar, meaning about 4 or 5 guest ales usually. On my latest visit I had a pint of Goffs Lancer. Despite being more central than the Gatehouse, food prices are cheaper (Sunday lunch £6.49). I was going to order my usual Mexican Burger, but noticed some “mangers specials” of curries for £2.99 – so I ordered the Sweet Potato curry. Unfortunately O forgot to specify, so it came with chips instead of rice ! Finally, a word of warning, the place does tend to get crowded with families with small children, though my latest visit was OK.
6/10 – better than the average Spoons. 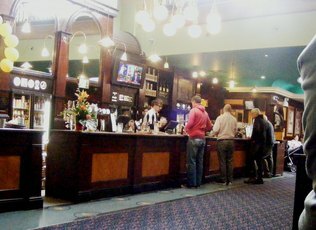 Spacious and well run Wetherspoons, with a good range of well kept ales. Only drawback is the lack of a smoking area. The address for this pub is 16/18 Tamworth Street not as shown above.